Already in 1981 Autophon, a radio and phone manufacturer in Switzerland , detected a high level of short-circuits on receptacle adapters coated with tin (Figure 1). Specifically from a total of 30 receptacle adapters, 8 were faulty with a total of 13 short circuits, which indicates the possibility of multiple short circuits per adaptor. 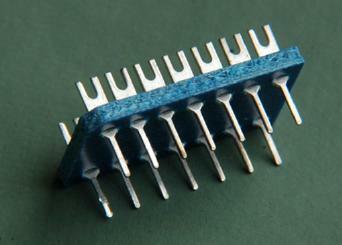 The resistance between the adjacent pins reached values of 7 – 125 ohms. Examination of the receptacle adaptors under an optical microscope revealed the electrically conductive tin whiskers causing the short circuit failures. Quite clearly the whiskers were responsible for the short circuits. 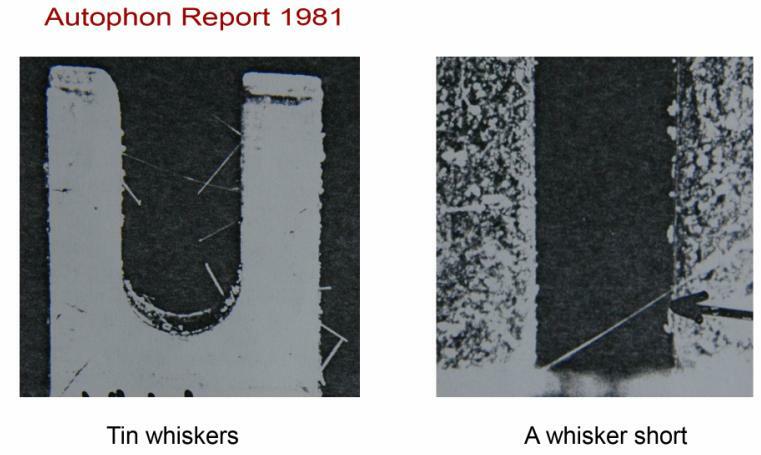 Some 27 years later, stimulated by the reports posted on the NASA Tin Whisker Homepage (http://nepp.nasa.gov/whisker), P. Fontana and R. Pock used a scanning electron microscope (SEM) to observe the same sample again. Indeed the undesirable presence of tin whiskers is confirmed, however, in a much greater resolution and showing significantly better detail. It is like a “walk through a whiskers exhibition”. On the same receptacle adapter a wide variety of whisker types could be observed: Straight-, kinked- and spiral shaped filament whiskers, nodules and hillocks! The spontaneously growing tin whiskers are crystals which grow from the base. 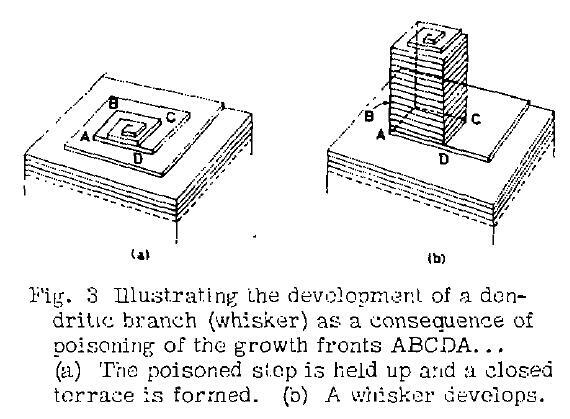 An excellent overview of the history of tin whisker theory (1946 –2004) is given by G. Galyon . In most reports internal and external stress is mentioned as driving force for whiskers growth. J. Brusse  is convinced that metal whisker growth is a case of “crystal growth” and should not be confused with a simplified model of extruding metal as if squeezing it through a die. Let’s start with spiral shaped whiskers having diameters of only 0.7 microns (SEM image 1). The author assumes that internal stress in the whisker is responsible for this morphology. 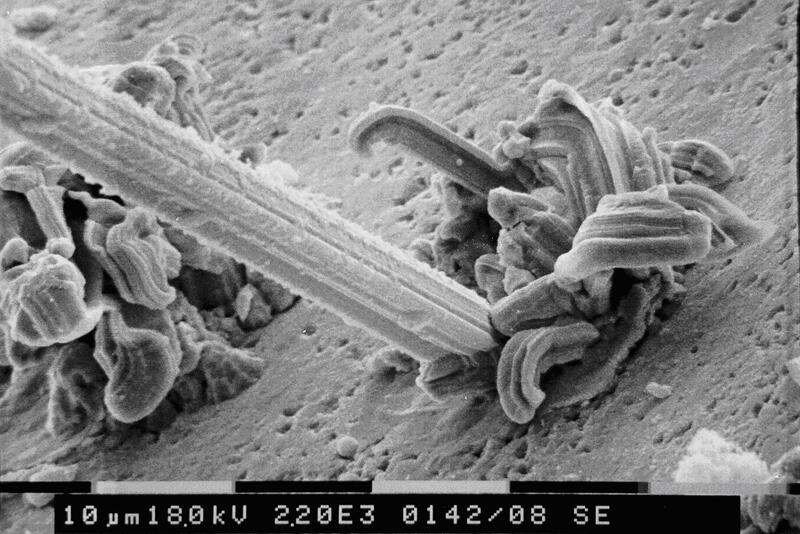 SEM image 1: Spiral shaped tin whiskers. 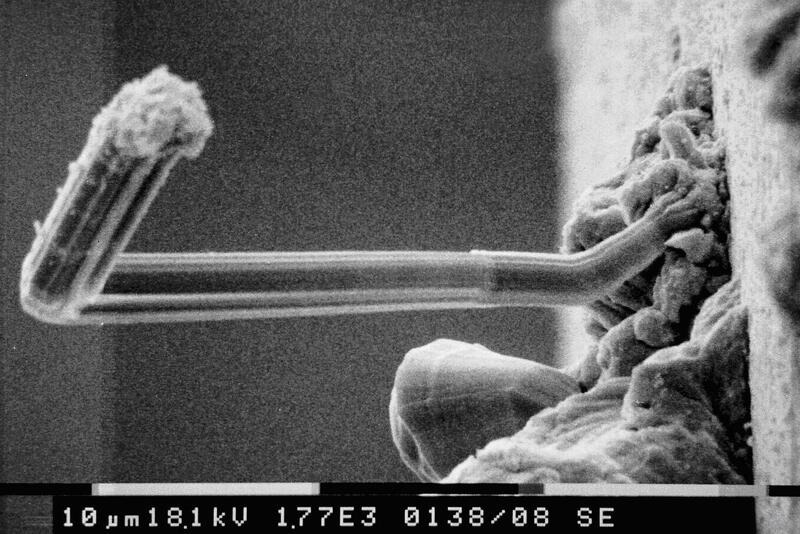 SEM image 2: Nodules and a filament whisker. SEM image 2 shows a typical kinked whisker with a diameter of about 4 microns that abruptly changes the growth direction through 90 degrees. K.N.Tu et al. found by electron diffraction that the growth direction is the c-axis. They observed a few spots in the electron diffraction pattern which might be dislocations. The kinked shape however is not compatible with a simple growth mechanism based on a screw dislocation. It has not yet been explained how and why the direction of the screw dislocation changes. The filament appears to emanate from the nodule. A common question is which came first the nodule or the filament? J. Brusse observed both cases! and . K. Tsuji assumed that whiskers grow on nodules as a result of the tendency of reducing surface-free energy of nodules . 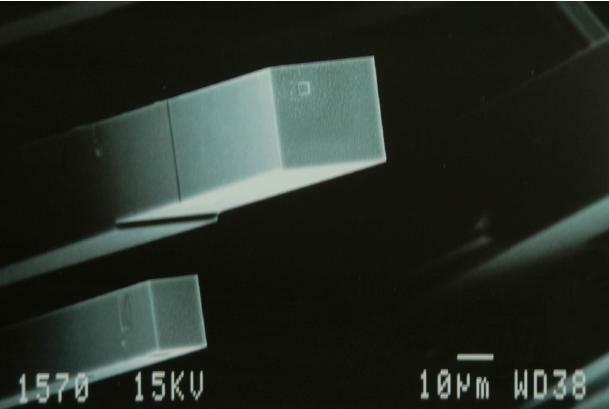 SEM image 3 shows a crack in the surface tin oxide layer. Partly tin is extruded through this crack and the deformed nodule is formed. It would be interesting to know if nodules are amorphous or if tin recrystallised after the extrusion. Single crystals cannot be so flexible! K. Tsuji observed that under the nodules recrystallized grains are developed and suggests that a nodule itself may be a recrystallized single crystal of tin . Perhaps “embryo whiskers” can be seen in the rings in Figure 3. 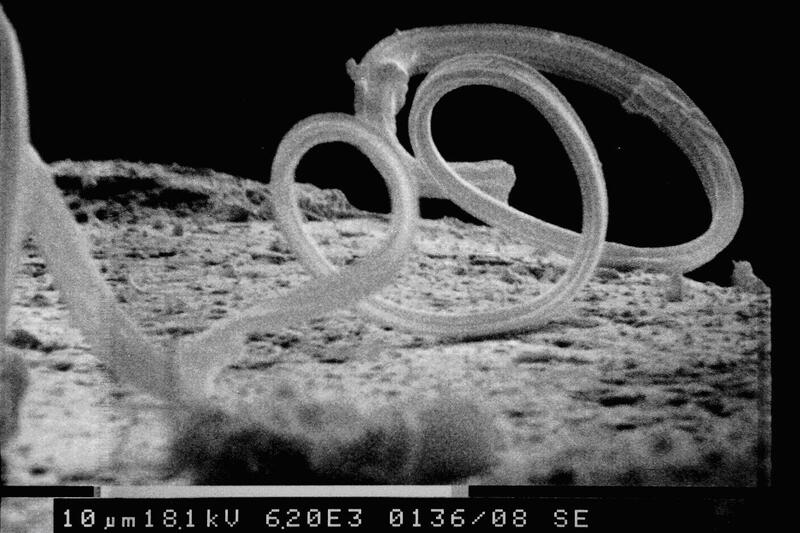 SEM image 4: The base of a filament whisker (straight, 0.4 mm long) surrounded by deformed nodules. 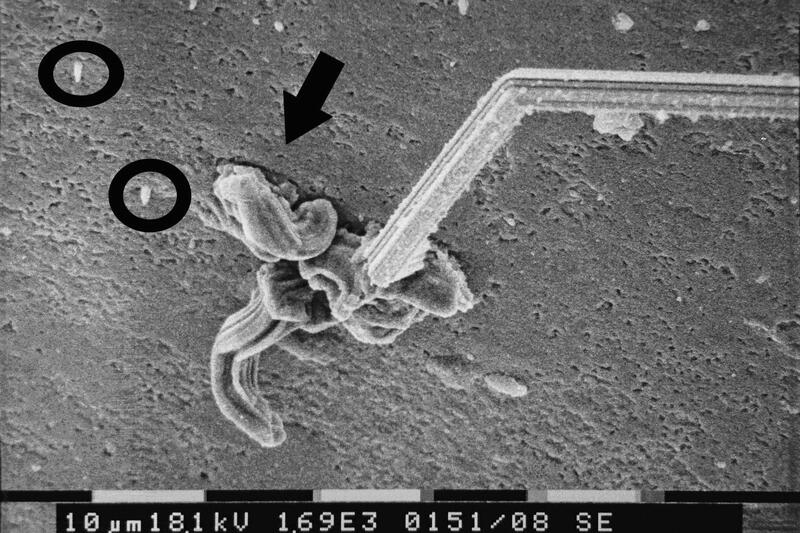 In SEM image 4 the two nodules and the base of a straight 0.4 mm long filament can be seen. It has been found that mostly the whiskers growth direction is the c axis  but growth along other axes such as  and  have also been found . SEM image 5: A nodule with a hillock and a kinked filament. 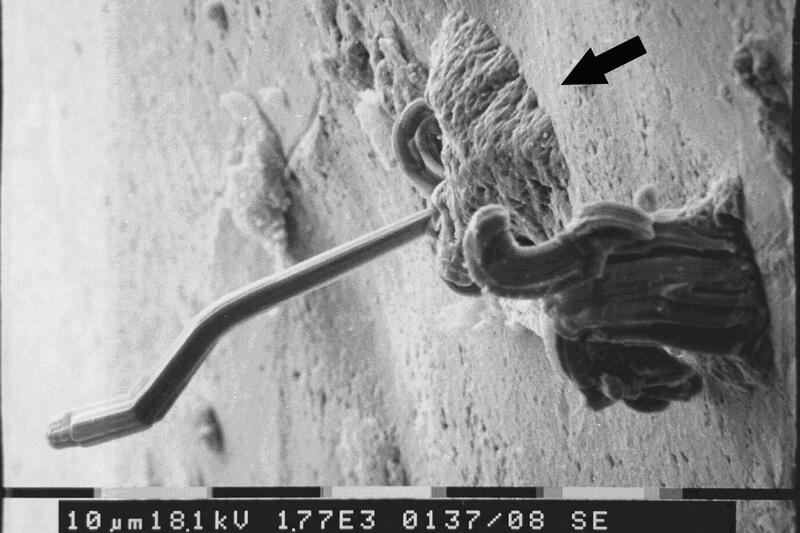 SEM image 5 shows a hillock with the adjacent kinked whisker and a nodule. Based on the completely different surface morphologies they must be built by three different growing mechanisms. W. J. Boettinger et al. noted under the hillock a significant change in the as-plated columnar grain structure. Under the filament whiskers no grain boundary motion has occurred . What could be the reason for the typical morphology of the surfaces observed in nodules and filaments? G. Eng et al. stated that the fluted appearance arises because the initial crack formation in the upper surface tin oxide layer occurs at the grain boundaries edges. Tin whiskers grow at the base and salt whiskers at the tip. In contrast to the growth of whiskers in a salt solution, the growing tin crystal is surrounded by other tin grains and therefore it has no free space to develop unlike in the aqueous salt solution and therefore no flat crystal faces can be expected in the case of tin. In the next section it is explained how salt whiskers grow and how they look. On behalf of the salt producer “Schweizer Rheinsalinen” P. Fontana studied the changing morphology of salt crystals (NaCl) by adding impurities to aqueous solutions of salt. 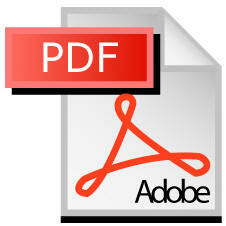 S. Amelinckx  reported that the addition of polyvinyl alcohol induce the growth of NaCl whiskers. The growth of these salt whiskers is easier to understand! They grow (in contrast to the tin whiskers) at the tip by a mechanism involving screw dislocations on the 001 faces. A screw dislocation is a permanent step for the attachment of sodium and chlorine ions. This spiral growth explains the preferential growth direction of the cubic salt crystal. The single crystals can develop uninterrupted in the salt solution and therefore the typical flat surfaces of crystals are formed. showing the crystal’s typical flat surfaces.